Multiple sclerosis is an autoimmune disease in which self-reactive T cells attack oligodendrocytes that myelinate axons in the CNS. Experimental autoimmune encephalomyelitis (EAE), an animal model of multiple sclerosis, is dependent on caspase-1; however, the role of Nod-like receptors upstream of caspase-1 is unknown. Danger- and pathogen-associated molecular patterns activate Nod-like receptor 3, which activates caspase-1 through the adaptor protein, apoptosis-associated speck-like protein containing CARD (ASC). We report that the progression of EAE is dependent on ASC and caspase-1 but not Nod-like receptor 3. ASC−/− mice were even more protected from the progression of EAE than were caspase-1−/− mice, suggesting that an inflammasome-independent function of ASC contributes to the progression of EAE. We found that CD4+ T cells deficient in ASC exhibited impaired survival; accordingly, ASC−/− mice had fewer myelin oligodendrocyte glycoprotein–specific T cells in the draining lymph nodes and CNS. Multiple sclerosis (MS) is an autoimmune disease in which myelin-reactive CD4+ T cells infiltrate the CNS and induce demyelinating disease (1). Experimental autoimmune encephalomyelitis (EAE) serves as an animal model of MS; it is induced by immunization with a peptide from myelin oligodendrocyte glycoprotein (MOG) emulsified in adjuvant. The infiltration of MOG-specific T cells and other inflammatory cells into the CNS is critical for the development of EAE (2). NOD-like receptors (NLRs) are a recently discovered family of intracellular receptors that sense danger- and pathogen-associated molecular patterns. Members of the NLR family form a caspase-1–activating multiprotein complex, termed inflammasomes (3–6). Activation of caspase-1 mediates the proteolytic maturation of the cytokines IL-1β and -18. Genetic studies in mice suggest that at least four inflammasomes of distinct composition are formed in vivo in a stimulus-dependent manner: the NLRC4 inflammasome; the NLRP1 inflammasome; the NLRP3 inflammasome; and a fourth inflammasome, for which the NLR protein is unknown, triggered by Francisella tularensis infection (7). In addition to these NLRs, the HIN-200 protein absent in melanoma 2 was recently shown to trigger caspase-1 activation in response to cytoplasmic dsDNA (8–11). The bipartite adaptor protein apoptosis-associated speck-like protein containing CARD (ASC) plays a role in the interaction between NLRs/absent in melanoma 2 and caspase-1 in each of these inflammasome complexes. The essential role of NLRs in the immune system has led to several studies exploring their role in host defense and autoimmune diseases. For example, single amino acid mutations that result in uncontrolled NLRP3 activation cause an autoinflammatory disorder termed cryopyrin-associated periodic syndromes (12). Additionally, caspase-1 activation (13) and IL-1 signaling (14) are important in the progression of EAE, but the role of NLRP3 and the central inflammasome component ASC in the progression of EAE has not been examined. In this study, we show that ASC, but not NLRP3, is involved in the progression of EAE. We also demonstrate that the deficiency in ASC does not affect MOG-specific T cell proliferation or cytokine production in the periphery. However, ASC plays a role in the peripheral survival of mature CD4+ T cells. Therefore, ASC−/− mice have reduced numbers of MOG-specific T cells in the lymph node and CNS, resulting in protection from EAE. The generation of NLRP3-, ASC-, and caspase-1–deficient mice was described previously (15–17). Knockout mice were backcrossed for ≥10 generations into a C57BL/6J background. Mice were housed in a pathogen-free facility, and the animal studies were conducted under protocols approved by St. Jude Children’s Research Hospital Committee on Use and Care of Animals. EAE was induced, as described previously (18); it was given a score to indicate disease severity: 0 = no sign of disease; 0.5 = partial tail paralysis; 1 = limp tail; 2 = partial hind limb paralysis; 3 = complete hind limb paralysis; and 4 = complete hind limb paralysis and partial forelimb paralysis. Cells were harvested from auxillary lymph nodes or spinal cord on day 10 or 17, respectively, following immunization. Cells were harvested with MOG peptide for 5 h, with monensin added to the wells for the final 2 h of incubation for the enhanced detection of intracellular cytokines. The cells were stained with Abs for CD4 and TCRβ, fixed, permeabilized, and stained with Abs to detect intracellular IFN-γ, TNF-α, and IL-17. Cells were harvested from the spleen 10 d following immunization. A total of 2 × 105 cells were plated in triplicate in a 96-well plate with various concentrations of MOG peptide and incubated at 37°C for 48 h. [3H]Thymidine was added for the last 8 h of culture, and the amount of incorporated [3H]thymidine was measured. Cells were harvested from the spinal cord, as described previously (19). Briefly, mice were perfused with PBS containing EDTA and then spinal cords were dissected. The spinal cords were cut into small pieces and digested in 1 mg/ml collagenase D for 45 min. Spinal cord sections were passed through a cell strainer, washed once in PBS, placed in a 38% Percoll solution, and pelleted for 20 min at 2000 rpm. Pellets, which were composed of ∼15–20% lymphocytes, were resuspended in media and used for subsequent studies and analysis. Wild type (WT; CD45.1) mice, lethally irradiated with a split dose of 1200 rad, were injected with 5 × 106 bone marrow cells isolated from WT (CD45.1/2) and ASC−/− (CD45.2) mice and combined at a 1:1 ratio. Mature CD4+ T cells were isolated from WT (CD45.1/2) and ASC−/− (CD45.2) mice. A total of 6 × 106 T cells was injected at ratio of 1:1 (WT:ASC−/−) i.v. into WT (CD45.1) mice. Mice were bled at various time points, and the ratio of injected WT:ASC−/− CD4+ T cells was determined by flow cytometry. MOG-induced EAE is a murine model used to study potential mechanisms involved in the progression of MS. NLRP3 senses a number of danger signals, such as endogenous molecules released during tissue damage. Therefore, it is possible that danger signals are released during EAE development that activate the NLRP3 inflammasome, which could cause further inflammation and promote the progression of tissue damage. To test this, we immunized NLRP3−/−, ASC−/−, caspase-1−/−, and WT mice with MOG peptide emulsified in adjuvant. As reported previously (13), caspase-1−/− mice were less susceptible to EAE development (Fig. 1A). However, the role of upstream inflammasome components that activate caspase-1 during the progression of EAE is unknown. NLRP3−/− mice developed EAE similar to WT mice (Fig. 1B). However, ASC−/− mice were protected from the induction of EAE compared with WT mice (Fig. 1C). The protection seen in clinical scores of ASC−/− mice was also evident in histopathology; spinal cords from ASC−/− mice did not show signs of myelitis (H&E sections) or myelin loss (Luxol Fast Blue sections) (Supplemental Fig. 1). ASC−/−, but not NLRP3−/−, mice are protected from EAE. MOG-induced EAE was assigned clinical scores daily, as described in Materials and Methods. The average clinical score of all of the mice from two independent experiments is shown. WT and caspase-1−/− (A), NLRP3−/− (B), and ASC−/− (C) mice were monitored for signs of disease. Data are represented as the average ± SEM (n = 12–18 per group). This study is the first to show the critical role of ASC in the pathogenesis of EAE. These data suggest that the caspase-1 activation required for EAE progression is independent of NLRP3. The protection afforded in ASC-deficient mice was even greater than that seen in caspase-1–deficient mice (p < 0.001), suggesting that ASC plays a critical role in the mechanisms involved in EAE development, which is independent of caspase-1. ASC has been primarily described as an adaptor protein in the inflammasome complex, but newer reports are emerging describing inflammasome-independent functions of ASC. Such a role for ASC, which is independent of NLRP3 and caspase-1, has been reported in the pathogenesis of arthritis (20). However, the exact role ASC is playing independent of NLRP3 and caspase-1 is unknown. Therefore, we further explored the role of ASC in the mechanisms involved in the progression of EAE. A possible mechanism for the protection seen in ASC−/− mice is that the development of disease-specific T cells is impaired, as seen in an animal model of arthritis (21). To test this possibility, cells were harvested from the spleen 10 d after immunization, stimulated in vitro with various concentrations of MOG peptide, and analyzed for proliferation after 2 d. WT and ASC−/− mice responded similarly to all concentrations of Ag tested (Fig. 2A). The finding that proliferation in response to all concentrations of Ag was similar suggests that there is not a defect in the development of MOG-specific T cells or in their affinity for the Ag. This is in contrast to caspase-1−/− mice, which have impaired MOG-specific T cell proliferation in response to stimulation with MOG peptide (13). This again suggests an inflammasome-independent role for ASC in the progression of EAE. Additionally, CD3-driven proliferation of naive T cells from WT and ASC−/− mice was similar (data not shown), confirming that ASC deficiency does not affect T cell proliferation. MOG-specific T cells are present in ASC−/− mice, but it is possible that an altered cytokine production could contribute to the resistance in ASC−/− mice. Therefore, splenocytes were harvested from mice 10 d after immunization and incubated with MOG peptide for 48 h. Cytokines present in the supernatant were measured. We found no significant difference between WT and ASC−/− mice for any of the cytokines measured (Fig. 2B). 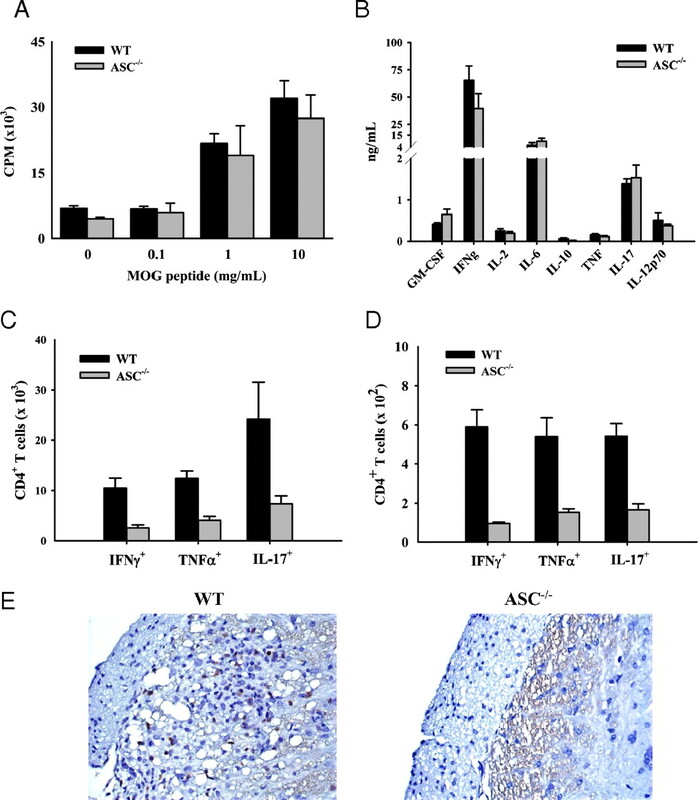 A recent study found that ASC played a role in Ag-specific T cell proliferation and IFN-γ production in an arthritis model, which was independent of the inflammasome (20). Although we see an inflammasome-independent function of ASC in the progression of EAE, it is not via the same mechanisms described in the arthritis models. However, the pathways leading to tissue damage in various autoimmune diseases vary greatly, and ASC may play a role in various models of autoimmunity via different mechanisms. Peripheral and CNS responses of MOG-specific T cells in ASC−/− mice during EAE induction. WT and ASC−/− mice were killed 10 (A–C) or 17 (D, E) days after immunization. A, Splenocytes were harvested and stimulated in vitro with various concentrations of MOG peptide for 48 h. [3H]Thymidine was added for the last 8 h, and its incorporation was measured. The cells were stimulated in triplicate and averaged together. B, Splenocytes were harvested and stimulated with 30 μg/ml MOG peptide for 48 h. The supernatants were harvested and analyzed for cytokine production with a Millipore cytokine bead-plex. C, Cells were harvested from the draining lymph nodes, stimulated with MOG peptide, and stained for intracellular cytokines, as described in Materials and Methods. D, Cells were harvested from the spinal cord, stimulated with MOG peptide, and stained for intracellular cytokines. The averages are plotted ± SEM. The data are representative of two independent experiments (n = 5). E, Spinal cords were removed 17 d after immunization and stained for CD3+ T cells using a rabbit anti-human CD3 Ab. Spinal cords representative of the group are shown (original magnification ×20). Despite normal MOG-specific T cell proliferation and cytokine production in the spleens of ASC−/− mice, there was a significant decrease in the number of MOG-specific Th1 and Th17 T cells in the lymph nodes draining the site of immunization 10 d after immunization (Fig. 2C). The decrease in the number of MOG-specific Th1 and Th17 CD4+ T cells was also found in the CNS 17 d after immunization (Fig. 2D). This decrease in ASC−/− mice was confirmed by immunohistochemistry staining for CD3+ T cells in the spinal cord on day 17 (Fig. 2E). For disease to progress in the MOG-induced model of EAE, MOG-specific T cells must migrate into the CNS and recruit other inflammatory cells. Therefore, it was not surprising that the infiltration of other inflammatory cells into the CNS of ASC−/− mice was decreased (Fig. 3A). The most dramatic decrease in infiltrating cells in ASC−/− mice was in leukocytes, but it was unknown whether this decrease was intrinsic to lymphocytes. The development and proliferation of MOG-specific T cells in ASC−/− mice seemed normal; therefore, we explored the possibility that ASC−/− T cells do not survive in the periphery as well as WT T cells. To examine this, competitive mixed bone marrow chimeras were created by injecting congenically marked WT and ASC−/− bone marrow at a 1:1 ratio into lethally irradiated WT mice. The proportion of WT and ASC−/− CD4+ T cells in the peripheral blood was examined 6 wk later. The percentage of WT CD4+ T cells in the blood was significantly >50%, the percentage expected if there was not a difference (Fig. 3B). To further validate a difference in peripheral survival, mature CD4+ T cells from congenically marked WT and ASC−/− mice were isolated and injected at a 1:1 ratio into naive WT mice. The ratio of WT/ASC−/− T cells was increased as early as day 1, which became greater over time (Fig. 3C). By day 10, only injected WT CD4+ T cells were detected in the blood (data not shown). The difference at day 1 could be contributed to the “take” of the injected cells into the blood, but because this ratio continued to increase from days 1–10, this clearly represents that ASC−/− CD4 T cells have decreased peripheral survival. Additionally, the ASC−/− CD4 T cells are not trapped in peripheral lymphoid organs, because the ratio of ASC−/−/WT T cells in the spleen and lymph node was not >1 (data not shown). The number of CNS-infiltrating inflammatory cells is decreased in ASC−/− mice, and the peripheral survival of ASC−/− CD4+ T cells is impaired. A, Cells were harvested from the spinal cords of mice 17 d after immunization, stained with surface markers, and analyzed by flow cytometry. B, Lethally irradiated WT (CD45.1) mice were injected with bone marrow from WT (CD45.1/2) and ASC−/− (CD45.2) mice at an equal ratio. The mice were euthanized 6 wk later, and the percentages of WT and ASC−/− CD4+ T cells were measured. C, Mature CD4+ T cells were isolated from WT (CD45.1/2) and ASC−/− (CD45.2) mice and injected into naive WT (CD45.1) mice at a 1:1 ratio. Mice were bled on designated days, and the ratio of injected WT/ASC−/− CD4+ T cells in the blood was determined by flow cytometry. The average is plotted ± SEM. The data are representative of five injected mice. In conclusion, we have shown that ASC plays a critical role in the progression of EAE, and this is, at least in part, independent of caspase-1. Additionally, we found that NLRP3 is not involved in the progression of MOG-induced EAE. In ASC−/− mice, the number of MOG-specific T cells in the draining lymph node and, in turn, the CNS was greatly reduced. This can be contributed to a decreased peripheral survival of ASC−/− CD4 T cells. This is one of the first studies describing an inflammasome-independent function of ASC, emphasizing the critical role that it plays in immune responses. We thank Anthony Coyle, John Bertin, Ethan Grant (Millennium Pharmaceuticals), Gabriel Nunez (University of Michigan), and Richard Flavell (Yale University) for the generous supply of mutant mice. This work was supported by grants from the National Institutes of Health (AR056296) and by the American Lebanese and Syrian Associated Charities (to T.-D.K.). 2009. Autoimmune T cell responses in the central nervous system. Nat. Rev. Immunol. 9: 393–407.
. 1998. Immune cell entry to the CNS–a focus for immunoregulation of EAE. Res. Immunol. 149: 781–789; discussion 844–846, 855–860.
. 2007. Intracellular NOD-like receptors in host defense and disease. Immunity 27: 549–559.
. 2002. The inflammasome: a molecular platform triggering activation of inflammatory caspases and processing of proIL-beta. Mol. Cell 10: 417–426.
. 2006. NALP3: a key player in caspase-1 activation. J. Endotoxin Res. 12: 251–256.
. 2008. NLRs at the intersection of cell death and immunity. Nat. Rev. Immunol. 8: 372–379.
. 2007. Francisella tularensis: activation of the inflammasome. Ann. N. Y. Acad. Sci. 1105: 219–237. 2009. AIMing 2 detect foreign DNA. Sci. Signal. 2: pe39.
. 2009. Innate immunity: cytoplasmic DNA sensing by the AIM2 inflammasome. Curr. Biol. 19: R262–R265.
. 2003. Regulation of cryopyrin/Pypaf1 signaling by pyrin, the familial Mediterranean fever gene product. Biochem. Biophys. Res. Commun. 302: 575–580.
. 1999. Caspase-1 regulates the inflammatory process leading to autoimmune demyelination. J. Immunol. 163: 2403–2409.
. 2009. Interleukin-1 and IL-23 induce innate IL-17 production from gammadelta T cells, amplifying Th17 responses and autoimmunity. Immunity 31: 331–341.
. 2007. Pannexin-1-mediated recognition of bacterial molecules activates the cryopyrin inflammasome independent of Toll-like receptor signaling. Immunity 26: 433–443.
. 2009. The intracellular sensor NLRP3 mediates key innate and healing responses to influenza A virus via the regulation of caspase-1. Immunity 30: 566–575.
. 2004. A deficiency in Drak2 results in a T cell hypersensitivity and an unexpected resistance to autoimmunity. Immunity 21: 781–791.
. 2006. The orphan nuclear receptor RORgammat directs the differentiation program of proinflammatory IL-17+ T helper cells. Cell 126: 1121–1133.
. 2009. Inflammatory role of ASC in antigen-induced arthritis is independent of caspase-1, NALP-3, and IPAF. J. Immunol. 183: 4003–4012.
. 2010. Inflammasome-independent role of apoptosis-associated speck-like protein containing a CARD (ASC) in T cell priming is critical for collagen-induced arthritis. J. Biol. Chem In press.